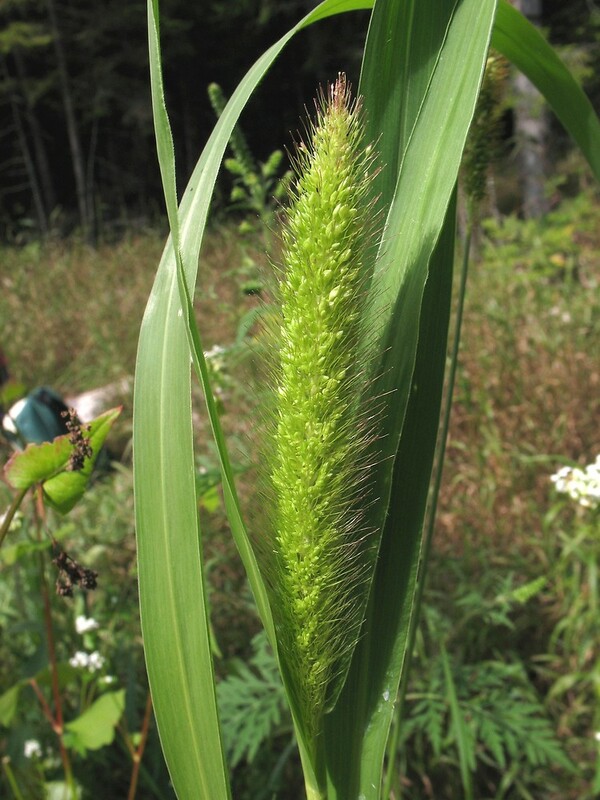 Setaria viridis. By Marilee Lovit. Copyright © 2015 Marilee Lovit.New England Wild Flower Society.gobotany.newenglandwild.org (Accessed 8/2015). Setaria viridis is an annual C4 grass (Downton 1971), 20 cm to 1 m tall (usually no more than 40 cm), base bent, often tufted, branched, rooting at lower nodes; roots associated with vesicular-arbuscular mycorrhizae, at least in young plants (Douglas at al. 1985); margin of sheath bristly, overlapping, inner margin membranous, ligule a fringe of hairs to 0.2 cm long, fused at base. Leaves to 15 (rarely to 30) cm long, 1.2 cm, flat, rough above, light green, tip long-pointed, nodding, midrib prominent below, hairless, slightly rough on both sides (Hitchcock 1950). Flower spikelets, on very short stalks, green, 1.6-2.5 mm, each spikelet above 1-3 pale bristles, about 0.8 cm long (often apparently more if some spikelets aborted), first glume 1/3 length of spikelet, second glume almost as long as spikelet; inflorescence a cylindrical spike to 15 cm long, 2 cm wide, secondary spikes smaller, erect but often nodding at tip, axis densely hairy; wind and self pollinated; blooms and fruits July-Oct. Seeds eaten by numerous birds and small mammals (Martin et al. 1951). Since bristles remain on axis after seed is shed, they are probably not involved in seed dispersal. Seeds can survive in soil for up to 21 years, but after 3 years germination rate drops to 50% (Douglas at al. 1985). Seedlings emerge in April-May (Keever 1979). Frequency in NYC: Occasional in natural areas. Setaria viridis.Wendy VanDyk Evans.U. Georgia. Bugwood.org.www.forestryimages.org. (Accessed 6/2014). Habitat: Common roadside weed, on fill, along sidewalks, other disturbed open areas; Intolerant of shade. Notes: plants eaten by rabbits (Martin et al. 1951). Responds to shading with increase in height. Requires 16 hrs. of light for optimum growth and reproduction. S. viridis is considered to be the ancestral species of the genus. 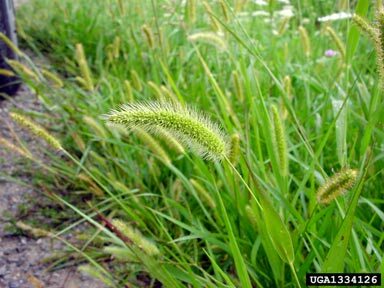 A large number of insects apparently feed on green foxtail grass. These include true bugs (Hemiptera); aphids, cicadas, planthoppers (Homoptera); leaf beetles (Chrysomelidae), leaf miners, root maggots and other flies (Diptera); grasshoppers (Orthoptera) and parasitic wasps that prey on plant feeding insects (Hymenoptera). Preyed by the nematodes Meloidogyne incognita and Pratylenchus spp. Infected by the fungi: gray leaf-spot, Piricularia grisea and Fusarium equiseti, (soil fungi, Deuteromycotina); downy mildew, Sclerospora graminicola, brown root rot, Pythium graminicola, and P. debaryanum (water molds, Mastigomycotina). Also infected by a number of mosaic diseases and other crop viruses (Agrios 1988; Douglas et al. 1985).